If you like cats, then you will certainly like this game. The game is not themed around your ordinary house cat, instead, it is themed around an adventurous cat who is an astronaut who loves to travel in outer space, therefore, earning its nickname, the cosmic cat. Once players load the game, they will see the Cosmic Cat in her astronaut outfit and space helm as she flies in the vast galaxy as she chases the mouse. Play Cosmic Cat Slot here. This exciting slot machine is a classical three reeled machine that offers players one single payline that can be found in the middle of the reels. Players will have to get winning combination of symbols of three matching icons in order to claim a payout. The icons that appear on the reels include the cosmic cat itself, the rat in an astronaut suit and green bar symbols. The highest paying symbol is, of course, the cosmic cat. It will reward players 500 or 1000 coins, depending on how many coins did they place, whether 1 coin or 2 coins.. 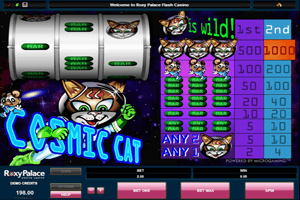 The cosmic cat is not only the highest paying symbol of this slot machine as it also acts like a joker in the card deck, which means that it will replace any of the other icons whenever it lands on the payline of the slot machine so it can help players form a better paying combo.